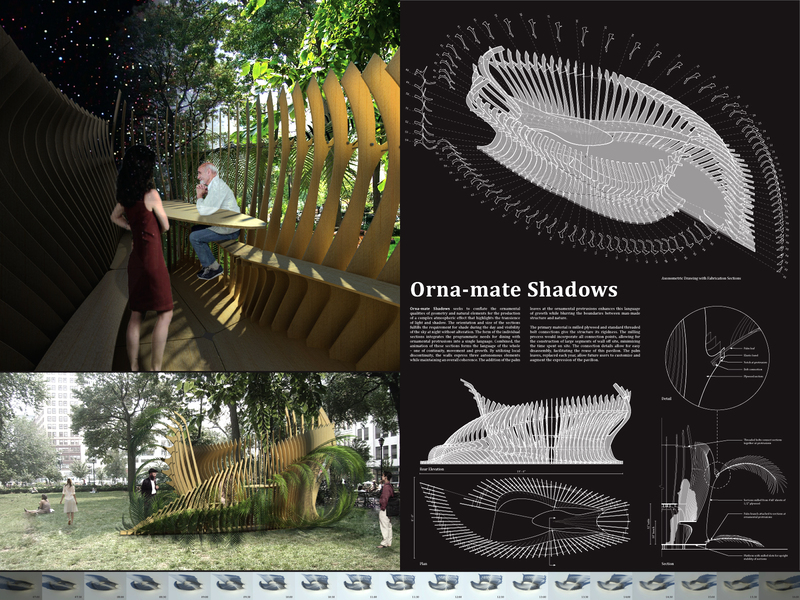 Orna-mate Shadows seeks to conflate the ornamental qualities of geometry and natural elements for the production of a complex atmospheric effect that highlights the transience of light and shadow. The orientation and size of the sections fulfills the requirement for shade during the day and visibility of the sky at night without alteration. The form of the individual sections integrates the programmatic needs for dining with ornamental protrusions into a single language. Combined, the animation of these sections forms the language of the whole – one of continuity, movement and growth. By utilizing local discontinuity, the walls express three autonomous elements while maintaining an overall coherence. The addition of the palm leaves at the ornamental protrusions enhances this language of growth while blurring the boundaries between man-made structure and nature. The primary material is milled plywood and standard threaded bolt connections give the structure its rigidness. The milling process would incorporate all connection points, allowing for the construction of large segments of wall off site, minimizing the time spent on site. The connection details allow for easy disassembly, facilitating the reuse of this pavilion. The palm leaves, replaced each year, allow future users to customize and augment the expression of the pavilion.